Disclosure: This conversation is made possible by Summer’s Eve®. Be sure to follow them on Instagram and Facebook. All thoughts and opinions expressed are my own. Winter is one of my favorite seasons because of the beauty of snow-covered rooftops and cooler temperatures. Winter brings a stillness and warmth after the leaves fall and the tree skeletons remain. For me, it’s a time of planning and an opportunity to start new routines. With all the hustle and bustle that comes with holidays, hosting, friends and family, it can be tough to stay fresh during the Winter months. from hyperthyroidism. Growing up and now, I struggle with keeping nervous sweat at bay so I found products that work, like washes and wipes. Thus, when I think about a brand that provides products to help women maintain their grace and freshness, Summer’s Eve® immediately comes to mind. In fact, they have two new products that will come in handy during Winter months. Especially at times when we need to bundle up in our goose down coats and wear wool hats to keep our bodies warm and cozy. Staying fresh can boost a woman’s confidence and keep her smile painted beautifully beside her rosy cheeks. And Summer’s Eve® Cleansing Wash delivers when we want to stay carefree and beautiful on a cold brisk Winter day. The Cleansing Wash is not too thick or loose, it goes on a washcloth smoothly and removes odor-causing bacteria. It’s also hypo-allergenic for our most sensitive feminine areas and doesn’t contain dyes or parabens. The fragrance is mild, but cleanses without overpowering your nose. It also won’t interfere with any lotions, sprays, or perfumes you decide to wear later. 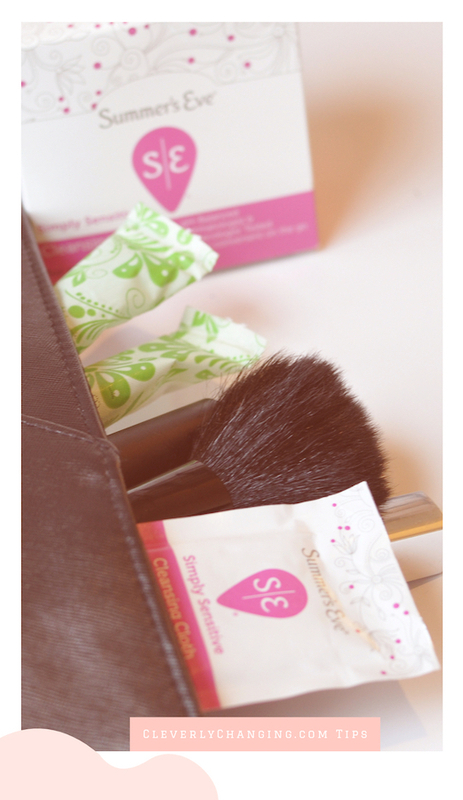 Summer Eve® Cleansing Cloths are my favorite Winter bag accessory. The durable wipes are small enough to fit discreetly inside our beauty bags beside our favorite beauty essentials. They are even packaged separately to maintain their moisture. In addition, they can give a lady an extra boost of self-assurance that regular toilet paper just doesn’t afford after a long day of running errands and working hard, especially during the busy holiday time. I prefer to keep several in my purse because they give me a shower-like clean feeling. They are also the only type of cleansing wipes that don’t irritate my sensitive skin. They are thick like a washcloth too, so one pack does the job. Basically, they are just as important to me as my lip balm is in the Winter, these are two products I’m not leaving home without. As a person who normally gets hot easily, winter can be tough for me to deal with especially when the heat is on blast and I’m dressed like I live in Antarctica. So whether I’m running errands, enduring back-to-back meetings, returning from the gym or having a visit from Aunt Flo, I can remain confident with these cleansing products. (1) Bergler-Czop, B., & Brzezińska-Wcisło, L. (2013). Dermatological problems of the puberty. Postepy dermatologii i alergologii, 30(3), 178-87. (2) Brooke, Dr. “4 Things You Need To Know About Your Weird Sweating – Better By Dr. Brooke.” Better By Dr. Brooke. N.p., 2018. Web. 23 Dec. 2018. (3) Brannon, Dr. Heather. “Does Water Dry Out Your Skin?.” Verywell Health. N.p., 2018. Web. 23 Dec. 2018.